At the age of three, Kerry Leigh was passing the hat while her father sang the blues. She dropped out of school in 7th grade, and became a full-time traveling street performer. 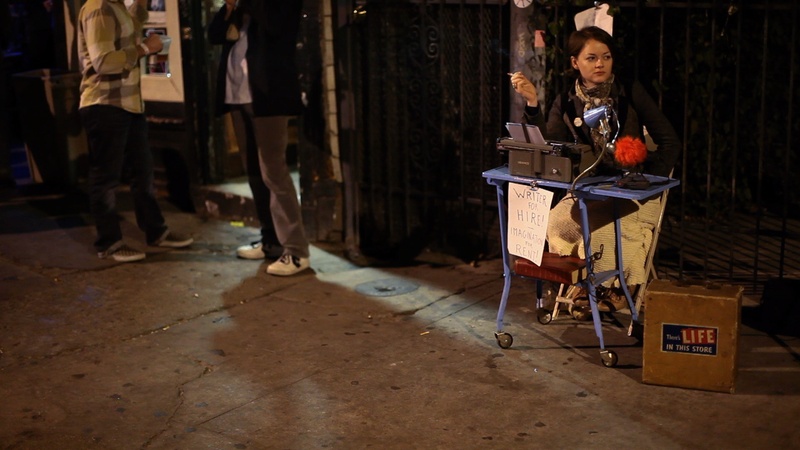 Now 26 years old, Kerry’s new act on Frenchman Street in New Orleans is renting out her imagination with a typewriter. She’s a modern day scribe, an old soul in a young body, and a brilliant writer stuck doing all she’s ever known, busking, on the same stage she’s ever known, the street. Sarah Cannon is a documentary film editor living and working in Washington DC. Isabelle Carbonell is a documentary photographer and documentary filmmaker whose determination to give a voice to the voiceless has driven her to document political, social, ethnographic, and environmental stories around the world. When filming, she becomes her environment — sleeping, eating, and breathing with those she is focusing on, absorbing their culture, transcending the divide between observer and subject easily.